Attestation and Apostile (Legalization) is a process of authenticating the documents issued in one country and intended for use in another country in order to be recognized as valid in foreign country. For assistance in legalization, kindly fill in your details and submit the same to us alternatively visit our office with your original documents and we shall assist you accordingly. The documents should be first authenticated by the Department of Education/Human Resource Development (HRD) of the concerned State Government. Attestation of documents by the Embassy/Consulate is completed in three stages. Firstly, the documents are authenticated/attested, as the case may be, by the HRD/Home Department/Sub-Divisional Magistrate. Subsequently, the documents are attested by the Ministry of External Affairs, New Delhi. Finally, the documents are attested by the Embassy/Consulate of the intended country. Personal documents (like birth or death certificates, marriage or divorce certificates, affidavits, general power of attorney, marriageability certificates, work experience certificates, driving licenses etc.) are required to be authenticated/attested by the Home Department / General Administration Department(GAD) of the issuing State. The Ministry of External Affairs attests the documents only after verifying the signature of the designated signing authorities of the State Government/Chambers of Commerce. Hence, it does not take responsibility for the contents of the documents. Commercial Documents are to be pre-authenticated by the respective Chambers of Commerce before these can be attested by the Ministry of External Affairs, New Delhi. Apostile: India is a member of the Hague Convention of October 5, 1961, abolishing the requirement of legalization of foreign public documents. Apostile is acceptable in 98 member-countries of the Convention. It is done for personal documents like birth/death/marriage certificates, Affidavits, Power of Attorney, etc. and educational documents like degree, diploma, matriculation and secondary level certificates etc. Procedure: All original documents requiring attestation or Apostile should be first authenticated by the designated authorities of the State from where the document has been issued. The Ministry of External Affairs legalises the documents on the basis of the signature of the designated signing authorities of the State Government/Chambers of Commerce; hence it does not take responsibility of the contents of the documents. In case of personal documents, Home/General Administration Department of the concerned State Government are the designated authorities. In case of educational documents, the documents should first be authenticated by the Education Department of the concerned State Government. Commercial Documents are to be pre-authenticated by the respective Chambers of Commerce. The details of the Regional Authentication Centres (RACs) in the States from where the documents should first be authenticated are given below. 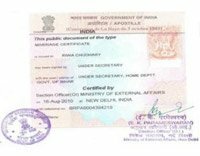 As a result to outsourcing of receipt and delivery of documents for Attestation/Apostile with effect from July 2012, no document from individuals is accepted at the Ministry of External Affairs Counter at CPV Division, Patiala House Annexe, New Delhi. Normal Attestation is done for all the countries who are not the member of Hague Convention and where Apostile is not accepted. Authenticated by the designated authorities of the State or Sub-Divisional Magistrate. Apostile sticker from Ministry of External Affairs (MEA).